In this study, we evaluated the efficiency of cefepime in the treatment of experimental Pseudomonas aeruginosa endophthalmitis. We compared the findings with the standard dose of ceftazidime (1 mg/0.1 ml). Thirty-six New-Zealand White rabbits were divided into 6 equal groups and were treated with different methods (Group 1 = sham, Group 2 = 0.5 mg/0.1 ml cefepime, Group 3 = 1 mg/0.1 ml cefepime, Group 4 = 2 mg/0.1 ml cefepime, Group 5 = 1 mg/0.1 ml ceftazidime, Group 6 = control). The eyes of rabbits in each group were examined clinically on 1 st , 3 rd , and 6 th day of the experiment. At 6 th day, 0.1 ml vitreous humor aspirates were obtained and plated for quantification on the blood agar and the results were expressed as colony-forming unit/ml. Subsequently, the eyeballs were enucleated and the histopathological evaluation was performed. Our findings denoted beneficial effects of cefepime in treatment groups (especially, in Groups 3 and 4). 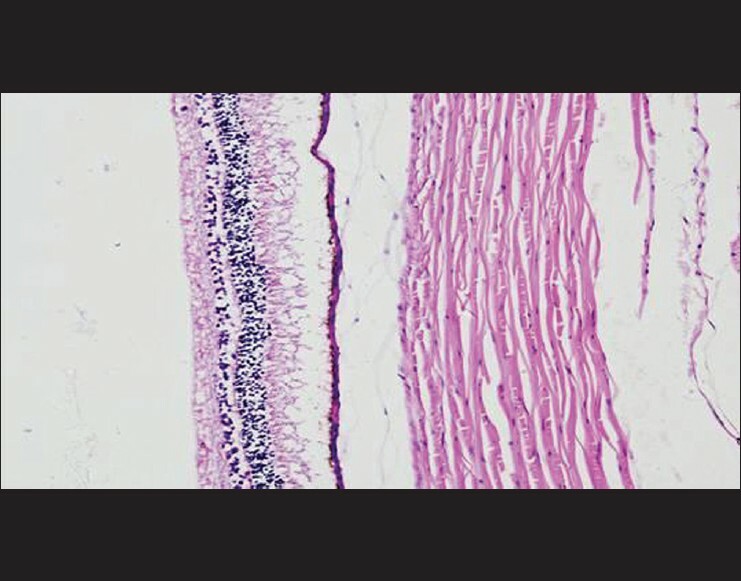 Intravitreal cefepime may be an alternative drug in the treatment of P. aeruginosa endophthalmitis. A majority of the episodes of endophthalmitis caused by gram-negative bacteria are due to Pseudomonas aeruginosa and members of Enterobacteriaceae. P. aeruginosa endophthalmitis is typically a rapidly progressive, sight-threatening condition that demands immediate therapeutic intervention. The ability of P. aeruginosa to survive on minimal nutritional requirements and to tolerate a variety of physical conditions has allowed this organism to persist in both community and hospital settings. The aim of this study was to compare the efficiency of standard dose intra-vitreal ceftazidime and different doses of intra-vitreal cefepime in the treatment of experimental P. aeruginosa endophthalmitis. Statistical analysis was performed with the SPSS version 15 to determine the differences between the three treatment groups. The Wilcoxon test, Mann-Whitney U test, and Kruskal-Wallis test were used in the statistical analysis as indicated. P values smaller than 0.05 were considered statistically significant. The mean and the standard deviation of clinical scores in 1 st , 3 rd and 6 th day after inoculation in groups are presented in [Table 1]. In 3 rd day, there was no clinical difference between Group 1 and Group 2, but in 6 th day a marked decline was noted in the clinical inflammatory findings in all treatment groups when compared with Group 1. Mean and standard deviation of CFU/ml values in groups are given in [Table 1]. Group 1 had significantly more CFU/ml when compared with the treatment groups. There was no statistically significant differences in mean CFU/ml values between treatment groups (Group 2 to Group 5), but the mean CFU/ml values of eyes in these groups and in Group 1 were significantly higher when compared with uninfected controls. The mean and the standard deviation of the histopathological scores in groups are presented in [Table 1]. 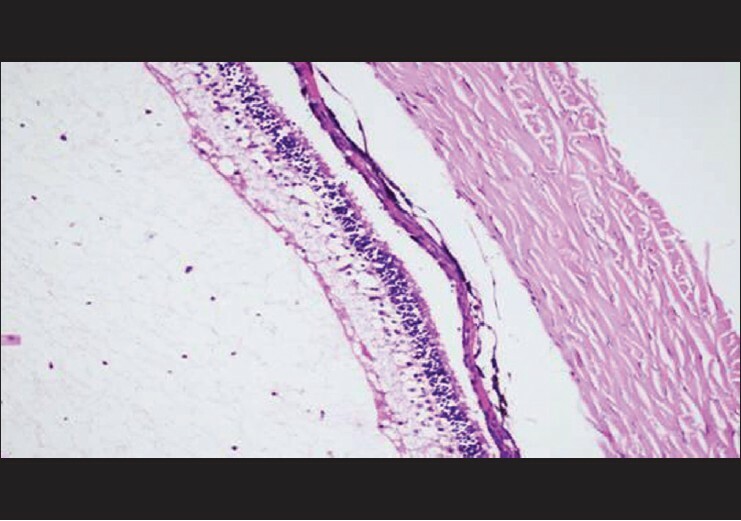 Histopathological examination in Group 1 and in Group 2 denoted severe inflammation in the vitreous cavity and total destruction of the retinal architecture [Figure 1], [Figure 2], [Figure 3]. 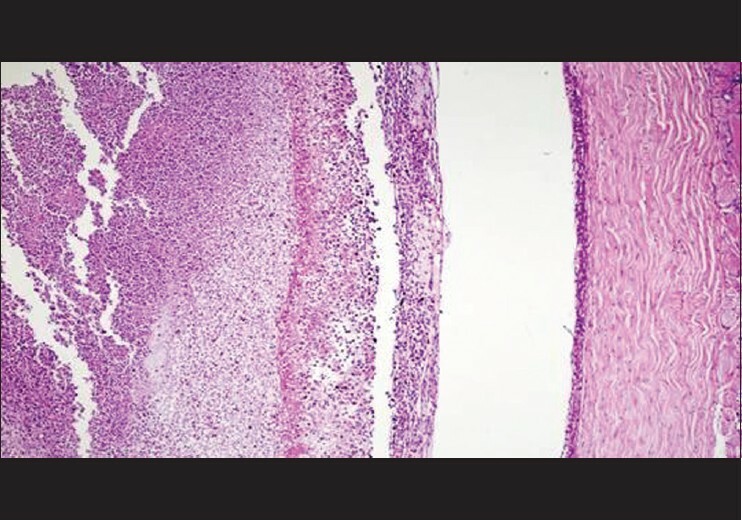 Histopathological findings were similar in Group 3, 4, and 5 [Figure 4]. The evaluation of clinical results in this study demonstrated that in 3 rd day after inoculation there was no difference between Group 1 and Group 2, but in 6 th day, a marked decline was noted in the clinical inflammatory findings in all treatment groups when compared with Group 1. These findings suggest that 0.5 mg/0.1 ml intravitreal cefepime was not sufficient to clinically control the P. aeruginosa endophthalmitis. Bacterial culture results showed us there was no statistically significant difference in mean CFUs/ml values between the treatment groups, but in Group 4 (2 mg/0.1 ml cefepime) the mean CFU/ml value was the least. Histopathological examination in Group 1 and in Group 2 denoted severe exudation and abscess formation in the vitreous cavity, dense inflammation in the retina and total destruction of the retinal architecture and partial or total retinal detachment. These results imply that 0.5 mg/0.1 ml cefepime was not satisfactory for preserving of normal retinal architecture. In summary, intravitreal cefepime may be an alternative drug in the treatment of P. aeruginosa endophthalmitis. Clinical and the histopathological results in our study indicate that 0.5 mg/ml cefepime is not satisfactory in the treatment of P. aeruginosa endophthalmitis. Intra-vitreal 1 mg/0.1 ml cefepime is as effective as intra-vitreal 1 mg/0.1 ml ceftazidime. Although increasing the intra-vitreal cefepime dose beyond 1 mg/0.1 ml provides additional benefits, this is not statistically significant. Hypothetically, taking into consideration the broad spectrum and lower resistance rates of cefepime, it may be an alternative drug in the treatment of endophthalmitis caused by other bacteria. Further, in vivo and in vitro studies need to be carried out to more accurately assess this subject. Satpathy G, Patnayak D, Titiyal JS, Nayak N, Tandon R, Sharma N, et al. Post-operative endophthalmitis: Antibiogram and genetic relatedness between Pseudomonas aeruginosa isolates from patients and phacoemulsifiers. Indian J Med Res 2010;131:571-7. Chen KJ, Sun MH, Lai CC, Wu WC, Chen TL, Kuo YH, et al. Endophthalmitis caused by Pseudomonas aeruginosa in Taiwan. Retina 2011;31:1193-8. Pleyer U, Mondino BJ, Adamu SA, Pitchekian-Halabi H, Engstrom RE, Glasgow BJ. 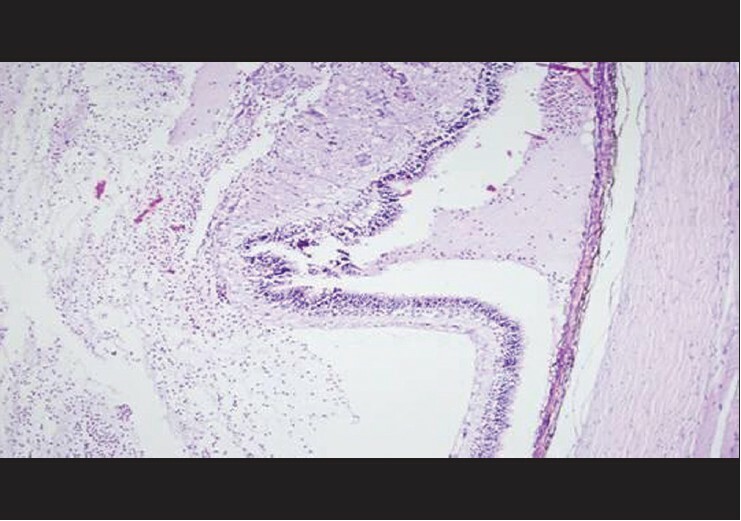 Immune response to Staphylococcus epidermidis-induced endophthalmitis in a rabbit model. Invest Ophthalmol Vis Sci 1992;33:2650-63. Meredith TA, Trabelsi A, Miller MJ, Aguilar E, Wilson LA. Spontaneous sterilization in experimental Staphylococcus epidermidis endophthalmitis. Invest Ophthalmol Vis Sci 1990;31:181-6. Roberts JA, Webb SA, Lipman J. Cefepime versus ceftazidime: Considerations for empirical use in critically ill patients. Int J Antimicrob Agents 2007;29:117-28. Yahav D, Paul M, Fraser A, Sarid N, Leibovici L. Efficacy and safety of cefepime: A systematic review and meta-analysis. Lancet Infect Dis 2007;7:338-48. Jay WM, Shockley RK. Toxicity and pharmacokinetics of cefepime (BMY-28142) following intravitreal injection in pigmented rabbit eyes. J Ocul Pharmacol 1988;4:345-9.